Should we give up on Reliance Power at Rs 177…and therefore RNRL too at Rs 45 ? Should we give up on Reliance Power at Rs 177 and therefore even RNRL at Rs 45 ? They tell us not to get Emotional where Investments and Stock Markets are concerned…..But do Emotions come from the Heart or from the Mind ! ? Anil Ambani has been facing the ire of Reliance Power allotee shareholders for over two years now…..The shares were allotted in the IPO at Rs 427.50…a 5% Discount for Retail Investors at the finalised IPO Price of Rs 450….Listing was hyped up to be at over Rs 700…QIBs Portion was oversubscribed 100 times and they got just a 1% allocation…..this was clearly an orchestrated application game….Why?…these QIBs were ready to pounce on Reliance Power at Rs 450…but on listing they simply shied away from the Scrip,not buying at even Rs 350 to Rs 375 levels ! So to appease allotees,Reliance Power declared a Bonus of 3: 5 just after the IPO in January/February 2008…this brought down the Holding cost to just over Rs 267….Reliance Power is currently quoted at Rs 175-Rs 180 range…it has had a 52 Week low of Rs 130….after the recent announcement of the RNRL Merger with Reliance Power in a 4: 1 ratio,big players have strongly suggested to Sell Reliance Power….one has a target of Rs 119 and another has Rs 128…..so will Reliance Power go even lower than it’s 52 week low of Rs 130 ? Now why would a Rational Investor pay Rs 177 for a FV Share of Rs 10 for Reliance Power when it’s yet 3 years to 5 years from building similar Capacity of 30000 + MW that NTPC has now! ?….when the share Price of a similar FV of Rs 10 of NTPC itself is just Rs 23 away at Rs 200 ?….Is it because of the Lower Equity of Rs 2396 crs that Reliance Power has because it collected a vulgar premium in January 2008 pricing it’s IPO at Rs 450! ?….and had to give in appeasement a Bonus of 3:5 immediately to bring down holding cost to Rs 267 as pointed out earlier…? Posted in ADAG Companies, Controversies, Corporate Governance, Interesting News Sightings, INVESTOR MISTAKES, Power, Reflections, STOCKS, VALUATION, When My Mind Meanders... Tagged ADAG Companies, Anil Ambani, JSW Energy, NTPC, Reliance Power, RNRL, Should you sell Reliance Power and RNRL? So now 2.34 is out and 4.20 is in !… One perspective is that RIL and the Government have done a 4.20 on this one! Mukesh Ambani could easily have honoured this MOU committment… it was blessed by the Mother… and in Mother India, the word of Mother is that of God !.… apparently the boiling intensity of emotions with his brother, Anil Ambani, prompted him to decide not to supply the gas at all….. So RIL chose to default citing that Government was the authority on allocation and pricing of Gas…. clearly government machinery was being misused and the government merely became a front… moot question arises… was the Government playing favourites or truly had the National Interest in mind ! ?.… the answer will stare at you in the face when you search history and discover that a top RIL executive was arrested because he was caught with confidential government documents…. apparently he was drafting/suggesting/amending a Union Cabinet Meeting Agenda for a Meeting to be held!…. also the current Petroleum Minister and the late Dhirubhai Ambani were great friends from their youth…. read the banned ‘Prince of Polyester’ by Hamish Mcdonald to gauge how close!…. Anil Ambani has already emotionally made these accusations and had rightly questioned as to why the Government has not withdrawn the PSC with RIL if they felt that it has been violated by the MOU ! Reliance Industries announces a Bonus of 1:1 !…Now ! Now ! Now ! But yesterday’s Bonus was clearly less preplanned….and Investors are no longer Children…and Mukesh Ambani is surely not the father ! And I was truly amused to hear the reason why Mukesh declared this Bonus….To reward Shareholders for this Value Creation of over a lakh Crores in assets and the completion of setting up of two major projects….gas and the new refinery….Bonus is declared from Free Reserves created by Operational Profits …Reliance has enough of these…but not from the two new projects yet !….even brother Anil rewarded,if you can ,I daresay, call it that,! shareholders of Reliance Power with a 3:5 Bonus last year,within months of the IPO…even before the Company has commissioned even one power project !…the bonus was to bring down the holding cost from the obscene IPO Pricing of Rs 427.50 to Rs 270 ! It’s quoted at Rs 160 right now…so now both brothers have ‘rewarded’ with bonus after creating the assets ! In Reliance,the Equity now will double from Rs 1642 crs to Rs 3284 crs with just a small dent of Rs 1642 crs in reserves of over Rs 1.1 lakh crs…The Book Value will halve from Rs 700 to Rs 350…Adjusted EPS for FY 10 would be in the Rs 60-Rs 65 range. Dressed in a Black Suit and even a Dark (Black?) Tie probably reflected his subdued and sombre look…looked as if he has not slept well last night….There was not even a flicker of a smile and he was lacking his usual confident and aggressively positive demeanour…..There was a person who created a mild sloganeering disturbance as Anil spoke,but was quickly whisked away from the Indoor Auditorium. Anil Ambani desperately needs his woo his shareholders to stay with his Group….and so now we have the personal touch….Addressing Shareholders as ‘Share Owners’….His ‘Share Owners’ would have appreciated more if he had only priced his Reliance Power Issue below Rs 200 and not at Rs 427.50….Maybe Anil,you can make amends by issuing Reliance Life Insurance at Par to the original allottees,who yet hold the shares, of Reliance Power ! 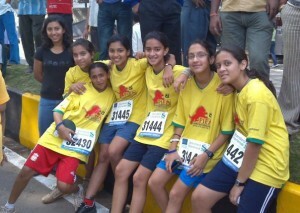 The Magic of the Mumbai Marathon ! 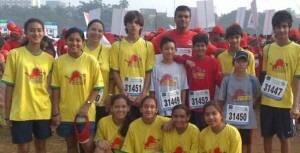 I ‘ran’ the Dream Run this morning at the Mumbai Marathon from the comforts of home…..What a spectacular uniting Force ! 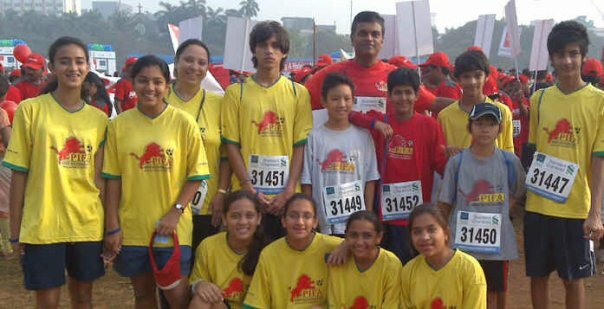 The Marathon has always been heart warming,but more so this year,as the memories of the 26/11 Terrorist Attack on South Mumbai are yet very vivid…..What 60 years of Independent India and politicians and Leaders could not bring about in India,these Nine Terrorists in just 60 hours united our Nation like never before ! My daughter (in red shorts in first photo and sitting second from right in the second) ‘ran’ the Dream Run of 6 km to 7 km with the PIFA …..a Football Academy and a Dynamic Enterprise run by Dynamic Anjali and Nirvan Shah, whose Goal is to Have India qualify for the FIFA World Cup in 2022 !…These kids have exceptional Energy levels….It’s been a hectic weekend for my daughter…Yesterday,she was away the whole day, competing at the State Gymnastics Tournament at the Andheri Sports Complex in Suburban Mumbai from 7 am till 8.30 pm……then joined around 40 of us at 9.30 pm till past midnight for a Victory Football Dinner for the Runner-Up Maharashtra State Girls u-14 Football Team at the Chennai Nationals,of which she was a Goalkeeper Member…Now after the Dream Run,she’s off this evening,to participate in a Gymnastics Demo at a Cricket Function at the Police Gymkhana on the Marine Drive Sea face…Phew ! Sitting at Home,I’m tired for her !